Glass is one of the key components in the manufacturing of insulating glass units determining numerous functions of insulating glass units. Glass packs are produced using 2 or 3 glass sheets. All glass units of such kinds can be tempered or laminated. All glass used in the manufacturing of insulating glass units is purchased from well-know European producers and comply with the requirements of European Standards. Divider frames are used for division of glass sheets in a pack at a given distance as well as for insertion of adsorbent. Aluminium frames are used most often in manufacturing of insulating glass units. "Warm edge" and stainless steel frames are used for improvement of the heat qualities of insulating glass units. It is the material used for reducing of humidity inside the insulating glass unit. Adsorbent is inserted into the remote frame. Butyl (polyisobutylene) is used for covering of sides of the remote frame filled with adsorbent and for gluing it to glass. This is the material which ensures hermetic qualities of the pack and protects the product against humidity and gas leakage. 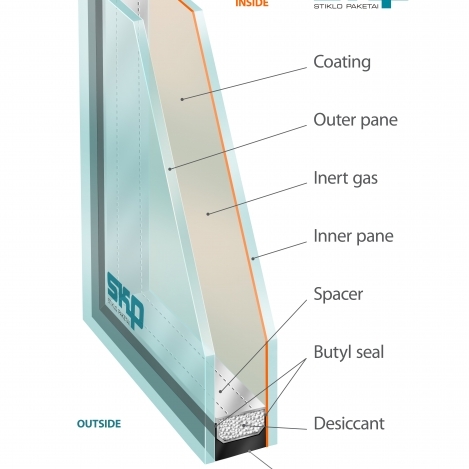 External sealant (polysulfide) is used for mechanical reinforcement of a insulating glass unit and securing its hermetic qualities.